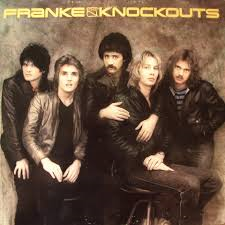 Actually, I’m quite surprised that no one pointed this out when I posted my “Triumphs and Tragedies” post for 1982. While the death of John Belushi was certainly a tragic occurrence, for metalheads, the terrible loss of Randy Rhoads was a far bigger tragedy because on March 19, 1982, the world was robbed of a guitar god. That is why I felt that Rhoads’s death deserved its own post because for metalheads, his death overshadowed everything else in 1982 in the same way that John Lennon’s murder did for the world in 1980. 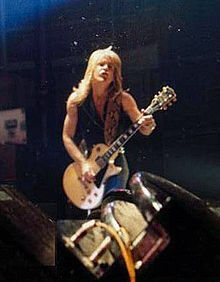 For any metalhead, it’s standard 101 to know that Randy Rhoads was killed in a plane crash on that tragic day in March, 1982 but it is only now that I have fully learned the full details behind the crash. The pilot had taken Randy and the band’s make up artist up in a small plane for a little bit of show boat flying. After making two successful attempts to fly close to the tour bus that was parked nearby, the pilot botched the third attempt, hitting the bus, severing the top of a pine tree before crashing into a garage of a nearby mansion. The contact with the bus forced Rhoads’s head to crash through the windscreen and then he was immediately incinerated when the plane exploded into a fireball after hitting the garage. While only God himself could have saved the three people in the plane, it still took over a half hour before the fire service arrived on the scene and then it was only one engine. This leads me to speculate two possible reasons for this. One was the fact that it was rural Florida and the local fire department would probably have been a volunteer one so there would have been a great delay in the response. The other, a result of me seeing anti- metal conspiracies all over the place, is the fact that the locals weren’t too bothered in responding quickly because it was a bunch of heavy metal people involved. In any case, heavy metal and the world lost a truly magnificent guitar player on that day. Standard Metal knowledge 102 teaches that while Randy is no longer with us, his legacy will never die. From that fateful day, the tributes to Randy Rhodes and what he has done for music continue to pour in. His former band Quiet Riot dedicated a song to him on their next album and Ozzy Osbourne released a tribute album to Randy a few years after that and rest assured, I’ll be visiting both when the time comes. Young guitarists still study his guitar style and Jackson Guitars still sell a replica of the one he used to wow audiences with his playing. Randy might have only lived for 25 years (way too young) but his memory has lived on for the last 33 years and will go on forever. Here’s where I should urge everybody to go out and listen to some album where Randy appears. There’s really no need because I know that everybody reading this will have already done so in the recent past and will continue to do so well into the the future. You may remember that when I first entered 1982, I spent eight of the twelve months of that year deployed with the marines. The first six months were especially difficult because I was floating about the Mediterranean Sea and Indian Ocean on a ship. So I didn’t get that much news especially news pertaining to music. However, one piece of tragic news that did reach my ears whilst on the ship was the death of comic actor and Blues Brothers singer John Belushi. Unlike the assassination of JFK, Belushi’s death may not have been a where were you moment when you first learned about it to most people. While I can say for sure that I was on board the ship when I learned about his tragic passing, I can’t say where exactly the ship was at the time. I do know that it was somewhere in the Indian Ocean. His career may have been short but John Belushi packed a load of things to remember him by during those few years. 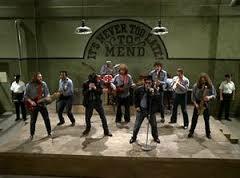 For us music fans, the biggest contribution to music was most certainly The Blues Brothers. His collaboration with Dan Ackroyd gave us a brilliant album and in 1980, a hilarious movie with one hell of a great soundtrack. For those new to 80smetalman, I have visited both on here if you want to take a look. 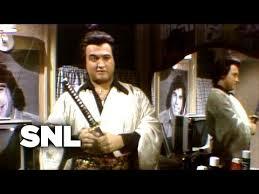 Older statesmen like me, however, will always love Belushi for his antics on the old Saturday Night Live show. I will always love his Samurai character. In 1982, a true musical and comical genius was tragically taken from us. R.I.P. John Belushi. Now on to the triumph. This year saw the third Monsters of Rock Festival at Donnington Park. Attendance was up from the previous two years and evidence that slowly but surely, heavy metal was taking over the UK. A small piece of festival history was made that year when Saxon became the first band to play at there for the second time. Headlining was another British band who failed to make it very far in the US, Status Quo. I have to admit, that I haven’t listened to them much over the years over the years. Guess I should rectify that. Other players that year included Gillan, Uriah Heep, space rockers Hawkwind and Canadian metal band Anvil. While it would be another year before I would hear about this great festival, I believe that this varied line up would have been a great thing to see and hear. Like I said at the beginning, my knowledge of musical events is limited due to the circumstances. So if there is some other event from 1982, triumph or tragedy, let me know and I will post about it because it is part of our history. Call this an urgent appeal. What happens when two known comedy actors produce a cool musical album? 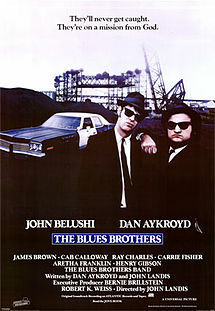 Well back in 1980, Dan Akroyd and John Belushi took their characters of Jake and Elwood Blues and made a hilariously smashing movie with a fantastic soundtrack. “The Blues Brothers” was probably the funniest film of 1980, (the only other contender would have been “Airplane”,) and ranks up there in the all time list. But what makes this film stand out more is that fact that not only was it a funny film that had me rolling in the aisle, but it had one hell of a soundtrack. 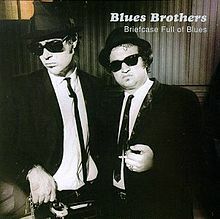 Some people were slightly disappointed that none of the songs from the Blues Brothers’ studio album “Briefcase Full of Blues” were featured in the film, especially the hit single “Soul Man.” My answer to that was that it didn’t need to be. The songs in the film were totally magnificent enough to stand on their own. Many of the songs still had that great sound with Belushi, or should I say Jake Blues’ vocals powering away with a phenominal assembly of studio musicians behind him. Elwood (Dan Akroyd) also lends his hand in both the lead and backing vocals department. In addition, there are some songs from the great artists who graced the screen with their talents like Cab Calloway, Ray Charles and Artetha Franklin. The result is a great mix of good old fashioned blues and soul that is completely mind blowing. 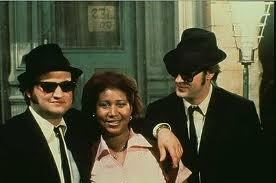 So if you want the combination of a good laugh and some great music, then go and watch The Blues Brothers film. I know that you will find that this film has plenty of both to go around. This album taught me a valuable lesson: Never judge an album until you’ve heard it all the way through. 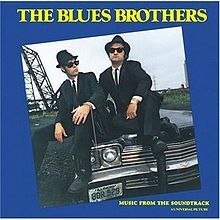 I first saw the Blues Brothers on the old Saturday Night Live show and seeing that the band was fronted by Dan Ackroyd and John Belushi, I expected it to be some kind of satirical take on music. After all, Gilda Radner introduced us to punk rock star Candy Slice on the show. 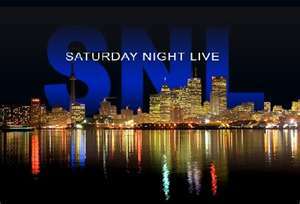 As a result, I was somewhat disappointed at first when the music didn’t have me rolling on the floor with laughter. That changed one night in early 1979. I was at the roller rink, skating hard in an attempt to ignore all the disco being played when “Soul Man” came blasting out of the speakers. My first thought was, “This song is good” and then I recognised the voice of John Belushi as Jake Blues. The song immediately went to number one in my mind and a week later, I got to hear the album “Briefcase Full of Blues” in it’s entirety. I was hooked! The other thing that made me a bit wary of this album was that it was a blues album. I remember John Belushi saying in an interview that he had been getting tired of rock and roll and that was why he turned to the blues. Back then, I was way too naive to realise that rock music came out of the blues. This album taught me different and I’m forever grateful for it. “Briefcase Full of Blues” is a bonefide classic album with some great tracks other than “Soul Man.” “Rubber Biscuit,” Messin’ With the Kid” and “Hey Bartender” all do it for me. 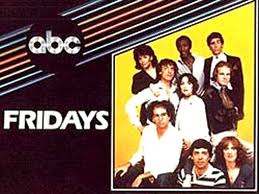 What helps make this album so good is the fact that Ackroyd and Belushi were able to round up some of the best studio musicians that were around at the time, including Paul Schaffer, who most people know from the David Letterman Show. This album opened my eyes to the wonderful world of the blues and forced me to appreciate its influence on rock. It also showed me that even people who have a reputation for being funny, can be serious singers too. A great album that helped me to see there are more types of good music out on the horizon.